Scripture tells us that the Holy Spirit is most visibly present in the least among us – something I witnessed firsthand during a transformative visit to Haiti this past summer. For one week, I stood among the Haitian people who, three years after the 2010 earthquake, still struggle to rebuild. 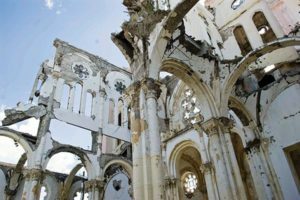 But I saw more than devastation; I saw Catholic Social Teaching put into action. During my first hours in Haiti, I could see nothing beyond utter brokenness. Eighty percent of Haitians live on less than $2 per day, and most eat only one meal a day. Electricity and running water are scarce, as is sanitation. Today 97 percent of Haiti’s forests are gone. 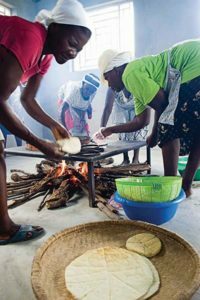 The abject poverty was at first jarring; however, soon, the many brief but endearing moments with the men and women of Haiti focused my eyes on Jesus’ presence through Catholic Relief Services’ (CRS) work. Modern Catholic Social Teaching originated with Pope Leo XIII’s encyclical Rerum Novarum in 1891 and continues today through the powerful words and humble acts of Pope Francis. It guides us to live with justice and love in our contemporary world. During my visit, it was evident that CRS has embraced Catholic Social Teaching’s first principle: deep respect for the human person and the dignity of each individual as one of God’s children. CRS approaches Haitians with respect, acceptance and love. 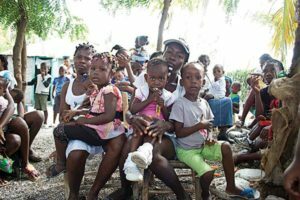 Of its 500 staff members in Haiti, more than 90 percent are native Haitians. CRS staff can relate to Haitians. They can understand and assess and then partner with local groups. CRS’ second core value is subsidiarity, also a principle of Catholic Social Teaching. Subsidiarity is the principle that social issues are best handled at the lowest or least centralized competent authority, closest to the affected community. CRS partners in almost everything it undertakes, typically with local groups. When no local group exists, CRS works to form one. CRS’ third core value — of solidarity and empowerment — is yet another Catholic Social Teaching principle. 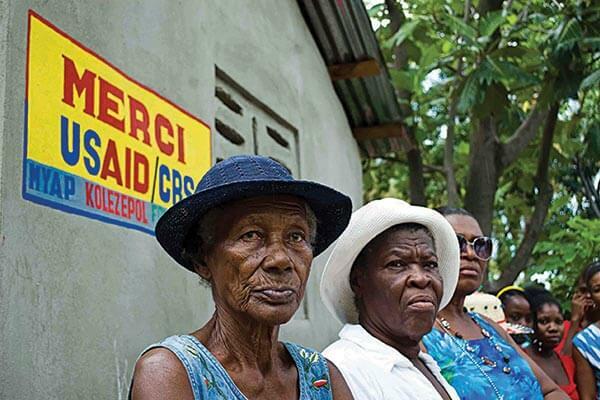 Haitians have their own word for solidarity, “Kole Zepol,” which means to “put shoulders together.” CRS’ strategy is to put shoulders together with Haitians to establish sustainable initiatives that will last and grow long after CRS funding has elapsed. It’s challenging for a visitor like me to envision how Haiti can rise again. However, I watched Catholic Relief Services bring hope and joy to thousands of men, women and children. I saw Haitians laugh and talk while balancing heavy boulders on their heads and walking up a steep hillside to build a retention wall to curb flooding. Another day, I helped an older woman plant a sapling, a small step in the long process of reversing deforestation. Yet nothing touched me more than listening to a mother’s powerful voice as she sang of how CRS had saved many children’s lives, including her own, by providing immunizations, nutrition and education. St. Mary’s President Tom Mengler was one of three Catholic university presidents invited by Catholic Relief Services (CRS) and the Association of Catholic Colleges and Universities to visit Haiti as part of an initiative to form partnerships with U.S. Catholic universities. 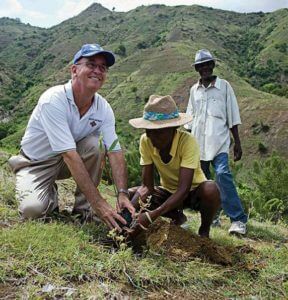 Mengler witnessed CRS’ international mission of providing emergency relief for the poor, met with Haitian citizens, and even helped a woman plant a sapling on her hillside property (pictured below). Photos courtesy of Catholic Relief Services.